This page illustrates how to use image acquisition with ON Semiconductor DevWare, which is a part of ON Semiconductor’s DevSuite. Imatest also supports other development systems. 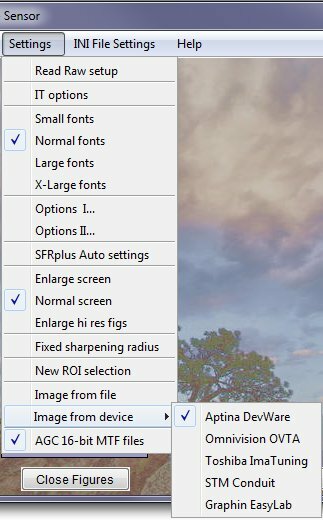 Load images directly from DevWare. This eliminates the need to capture images separately, store them, then load them individually into Imatest, dramatically improving productivity. Note: As of Imatest 5.0 image acquisition capabilities were added to Imatest Master and Imatest IS was discontinued. Learn more. Download and open the self-extracting executable (Imatest-IS-3.n.exe). 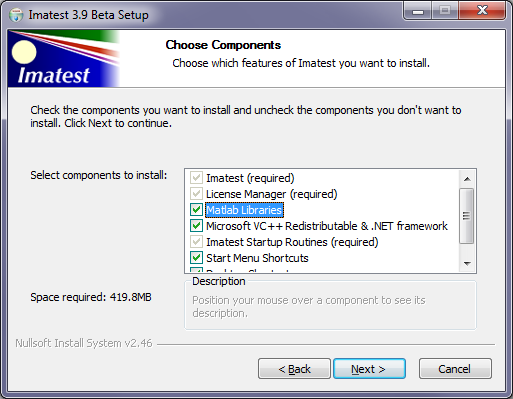 This will install Imatest and the Matlab Compiler Runtime (MCR), which is required for Imatest to run. The installer checks for the folder corresponding to the current MCR version (v714 as of March 2013). Matlab Libraries is checked if the folder is not found; otherwise it is unchecked. On rare occasions you may want to change this setting. Follow the remaining directions for installation. You will be able to run Imatest in evaluation mode for a limited time after you install it. If you’ve purchased it, open Imatest and press Help, License Manager (Activate). You can install Imatest Master on several computers, but you can only activate it on a single computer. www.imatest.com/activation/ contains instructions on activation/deactivation/moving Imatest between computers. To download DevSuite software, go to http://www.onSemiconductor.com/PowerSolutions/supportDoc.do?type=software&category=2209 and choose DevSuite General Software Installer. Install the software, then open it and follow the directions for registration. The registration process will take one business day, after which you receive an Email with login instructions. Open the DevWare software, which is required for Imatest to acquire an image. 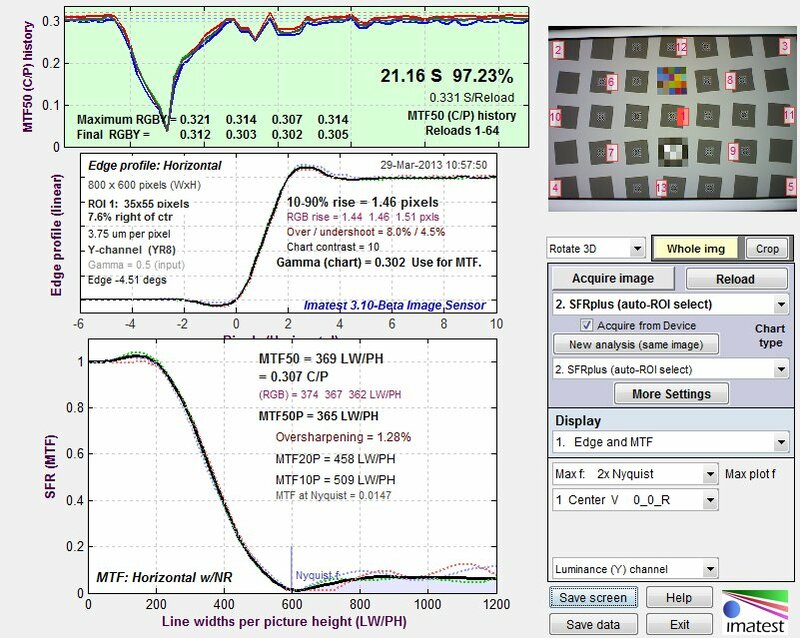 Rescharts: Measure sharpness (MTF or SFR) from any of several test charts, including ISO-12233 (or any slanted-edge chart), SFRplus, Siemens Star, Wedge (Hyperbolic or Linear), Log Frequency-Contrast, or Dead Leaves/Imatest Spilled Coins. Multicharts: Measure color accuracy and tonal response from a wide variety of color and grayscale charts, including the 24-patch Colorchecker, Colorchecker SG, IT8.7, DSC Labs Chroma DuMonde, ISO-14524, ISO-15739, Kodak/Tiffen Q-13/Q-14, Imatest 36-patch transmissive Dynamic Range charts, and many more. Uniformity Interactive: Measure vignetting (light falloff), color nonuniformity, and hot and dead pixels from a flat field image. Imatest defaults to reading images from files, not acquiring images directly from devices. You can configure it to acquire images from DevWare from the Imatest main window or from any of the three modules that supports image acquisition from DevWare (Rescharts, Multicharts, or Uniformity Interactive ). Click on Settings, move the cursor down to Image from file, and check ON Semiconductor DevWare. Check Auto Reload to enable continuous realtime reloading (updating). See the example on the right. You are now ready to acquire and analyze images. Select any of the three modules and click Acquire Image to acquire and analyze the image. Click Reload (to the right of Acquire Image) to start continuously refreshing the image. The button will turn pink and display “Stop Reload nn” (where nn is the reload number). Click on it to stop reloading and display final results. Continuous reload produces particularly useful results (showing the focus history) with the Edge and MTF display in Rescharts Slanted-Edge SFR and SFRplus modules. of an SFRplus image. The camera has been defocused, then refocused. Please refer to both the Imatest and DevWare Help files and associated usage guides for additional information. See Useful links, below. To purchase Imatest, use this link. You can obtain a list of introductory online documentation by clicking the Help guide button on the right of the Imatest main window. The Table of Contents/Site Map for Imatest documentation is on www.imatest.com/docs/. A list of image quality factors analyzed by Imatest is on www.imatest.com/docs/iqfactors/. Sharpness – what is it and how is it measured? is a good introduction to concepts of measuring sharpness. SFRplus is the most powerful module for measuring sharpness (over the image surface), lateral chromatic aberration, tone and color response, and more. You can find more details in www.imatest.com/docs/sfrplus_instructions. SFRplus can be run inside Rescharts using acquired Images from DevWare. The other two modules that can acquire images from DevWare are Multicharts and Uniformity Interactive. The Imatest Store offers a large variety of test charts in addition to software. Support for the Imatest is available at support@imatest.com. Please report problems using this mailbox, with complete text of the error message, which is best obtained by clicking File, Copy current session, and pasting into your email. For more information on troubleshooting and error reporting, click on the Error reporting button at the bottom of the Imatest main window or go to www.imatest.com/docs/troubleshooting/.